AICN HORROR Contest: Find out who won an ODD THOMAS BluRay & a Dean Koontz’s ODD THOMAS book set! AICN HORROR Contest Winner: Find out who won an ODD THOMAS BluRay and a set of Dean Koontz’s ODD THOMAS books! Ambush Bug here with another special AICN HORROR: ZOMBIES & SHARKS contest. 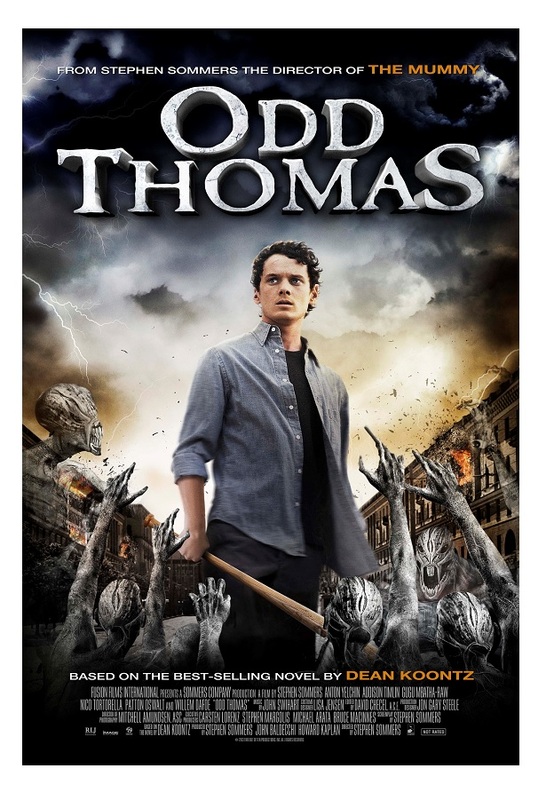 I posted my review of ODD THOMAS a while back and found it to be a surprisingly good time. Based on a series of books by Dean Koontz ODD THOMAS basically tells the origin of a kid who just seems to stumble into paranormal and occult phenomena. The folks behind the film offered to give a special prize which includes one BluRay of the film plus a collection of Dean Koontz’s ODD THOMAS books to one lucky reader. I asked readers to simply send me something that struck them odd lately and I got a boatload of interesting responses. But like Christopher Lambert, there can be only one! So here’s the winning submission of odd from Matt Brown! Last week I posted a classified ad to sell a guitar amp, and came across two different people looking for it: The first person was a spammer, and though the text convo was AMAZING I thought you’d disregard this email if you saw pic attachments so I will err on the side of caution and skip to the second fella. The second was the guy that actually bought the amp. He met me outside of a Walmart. He was driving a large frightening motor home containing at least two families (one of an odd-looking partially Asian race) and a handful of dogs. He got out to check out the amp and flies and bees—YES BEES!—were swirling around him as though he was their queen; he smelled horrific. He was wearing a tuxedo but it wasn’t clean or constructed in the last decade, an odd faded black, and he had a very powerful Christian Bale-like comb-over in addition to women’s sunglasses. He had a very gravelly high-pitched voice with a southern accent, even though we’re in Salt Lake City where very few southern accents are to be found. For a good long while I thought I was going to be abducted, raped and ultimately crafted into a new tuxedo. Fortunately, after some strange discussion and a handful of his glances to his families, he paid in tens. This was a $1000 amp, and he paid me in tens. But the money was all there. Truly, truly odd indeed! Congrats to Matt and thanks to all who entered the contest! Here’s the trailer for ODD THOMAS below!